When Sarah Abramovitz, Coordinator at the David Bradley Children’s Bereavement Program at Penn Homecare and Hospice ran into Chris Cavalieri, Executive Director of Family Lives On Foundation at the NAGC Symposium On Children’s Grief this summer, they had a lot to talk about. Chris and Sarah get started. Sarah, who is an Art Therapist, was busy counseling bereaved children and gearing up for Camp Erin where she is the Clinical Director. Chris was on a whirlwind outreach tour culminating in the national expansion of Family Lives On’s Tradition Program that enabled many bereaved children from 28 of the 50 United States to enroll. After discussing many topics in depth, Sarah and Chris realized that they had a common goal. They both ached to increase the depth of the average citizen’s awareness around Children’s Grief. A grand plan was hatched. Together, for Children’s Grief Awareness Day, 2014, Family Lives On and David Bradly Children’s Bereavement Program would collaborate. This week, Chris had children from Montgomery School in Chester Springs, PA make handprints in blue paint on white paper. 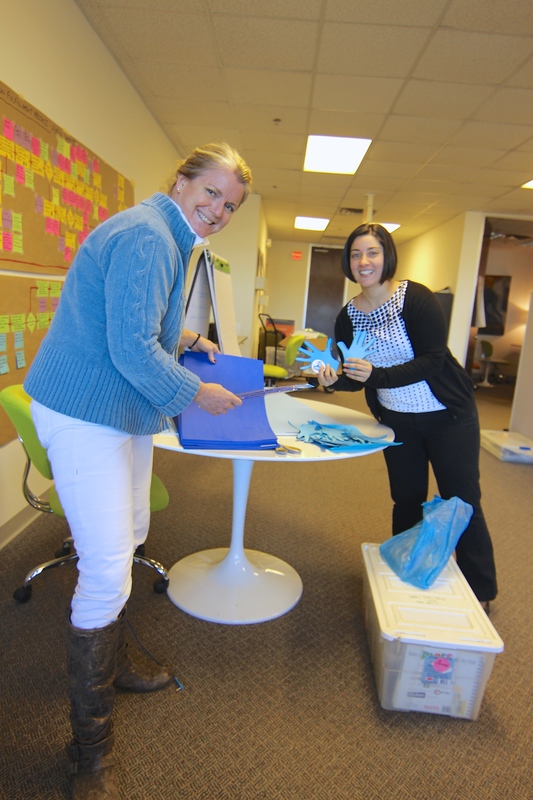 Jodi who is on staff at FLO, diligently cut out those hands and many more from blue construction paper. 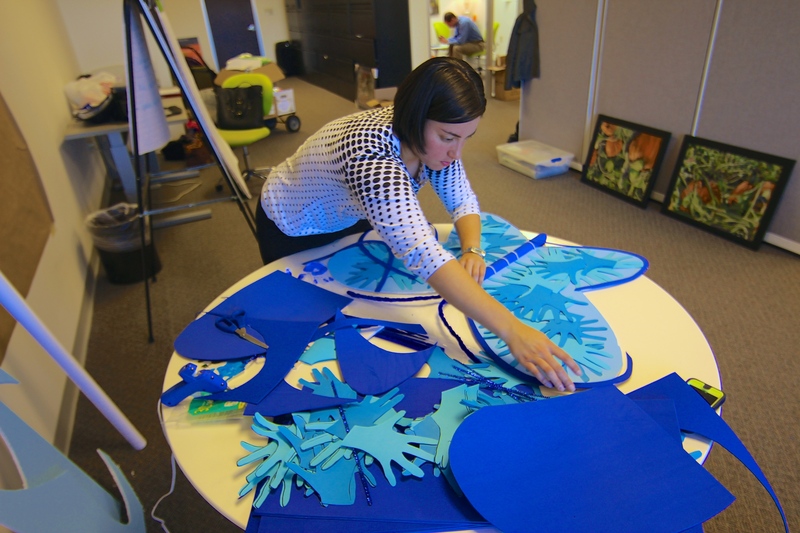 Sarah arranged the hands artistically and she and Chris adhered them to foam board with glue. They added pipe cleaners and plastic zip ties to create a gorgeous, blue butterfly with moving wings, signifying Children’s Grief Day. Digital graphics were created and will be uploaded and cross promoted on social media platforms for both organizations. 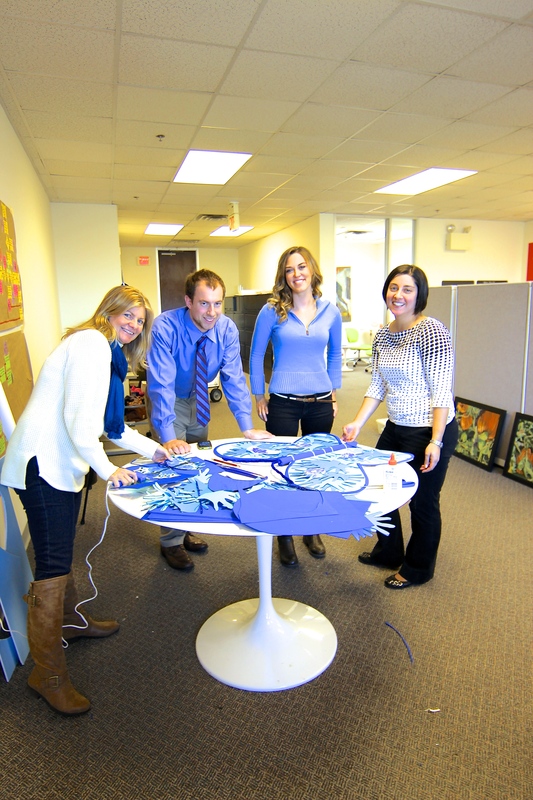 And the staff wore blue in honor of CGAD. There are more than two million children and teens grieving the death of their mother or father, and 1 in 20 children experience the death of a parent before the age of 16. Family Lives On’s Tradition Program is a free, direct service for such children that supports their bereavement process. The program takes place within the child’s daily family life, helping children continue the traditions they celebrated with their deceased parent. When it comes to loss of life, children have special needs – they do not have the same avenues or outlets as adults to express their grief, or the experience to understand all they are feeling. Wissahickon Hospice’s David Bradley Children’s Bereavement Program provides emotional support for young survivors of hospice patients and guides them through the bereavement process in a safe, sensitive environment that caters directly to their needs. 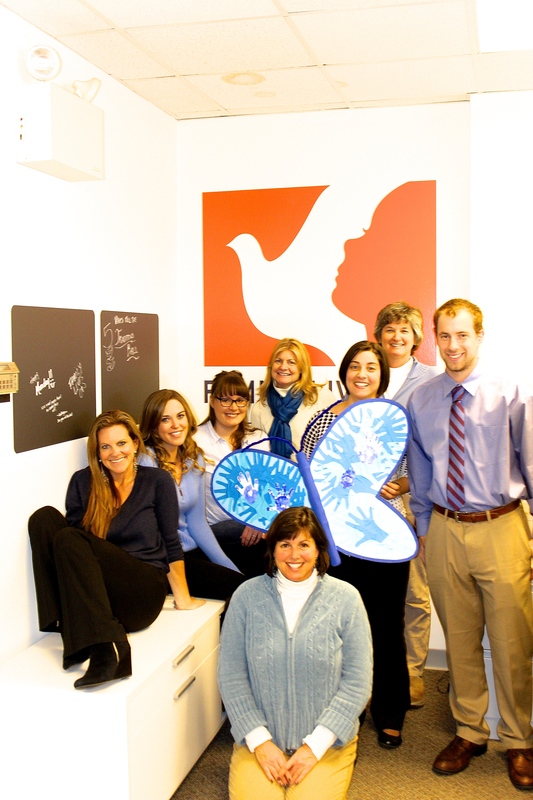 Family Lives On Staff Wearing Blue from Left to Right: Stacey, Jen, Isis, Kelly, Jodi, Tom and Susan (Volunteer-Kneeling), Sarah (center) from David Bradley Center is holding the Butterfly. Sarah is also the Clinical Director at Camp Erin-Philadelphia which is a weekend overnight camp for children who have experienced the death of a significant person in their life, such as a parent, sibling, other family member or friend. The camp combines traditional, fun, high-energy camp activities with grief education and support. Children’s Grief Awareness Day is designed to help us all become more aware of the needs of grieving children — and of the benefits they obtain through the support of others. 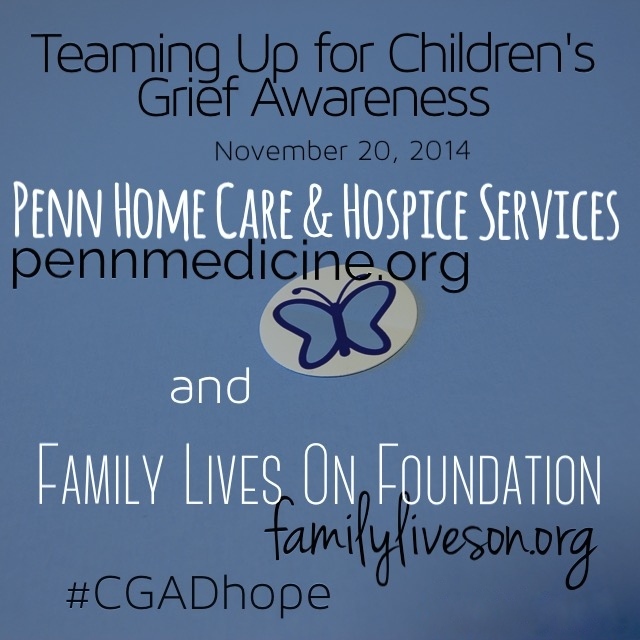 It is an opportunity to make sure that grieving children receive the support they need. Family Lives On Foundation, The David Bradley Center at Penn Hospice and Children’s Grief Awareness Day are partners in bringing attention to the fact that support can make all the difference in the life of a grieving child. This day provides an opportunity for all of us to raise awareness of the painful impact that the death of a loved one has in the life of a child, and an opportunity to make sure that these children receive the support they need. For more pictures of the creative endeavors of the day check the facebook page on Thursday, November 20th, Children’s Grief Day. Braydon Nichols, right, lost his father Bryan Nichols in 2012. (CNN) — Last August, a 10-year-old boy from Missouri wrote an iReport to CNN. 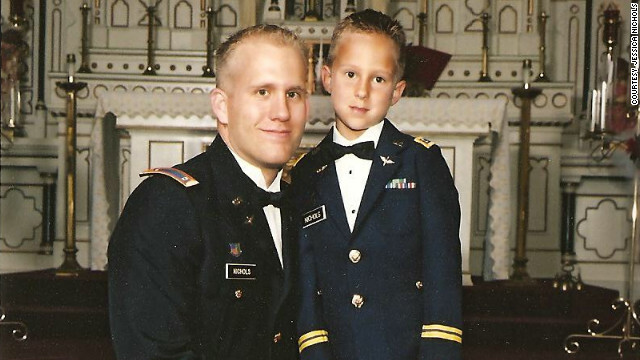 Braydon Nichols asked that the world not forget his father, an Army officer who died when the helicopter he and other soldiers were in was downed in Afghanistan. The grade-schooler’s iReport sparked a massive outpouring of love, encouragement and empathy. Thousands of people posted comments to the boy. Nearly 230 iReports were dedicated to him. No one would forget Army Chief Warrant Officer Bryan Nichols, everyone pledged. And over the past six months, CNN’s audience has not forgotten Braydon. There has been no let-up in comments online asking how the boy is doing and wishing him well. Those notes mean a lot to Braydon, his uncle Monte Nichols said. Braydon is excited about his summer vacation plans. A generous person in Hershey, Pennsylvania, is paying for the boy and his mother Jessica Nichols to fly to the city, tour a chocolate factory and have a fun weekend. Still, Braydon has good and bad days. This month is going to be tough for the family because Bryan Nichols was due home from deployment in March. Last year, weeks before that horrible August morning that she had to tell her son that his father was gone, Jessica Nichols recalled how Braydon loved to fantasize giddily about how he and his dad were going camping when he finished fighting bad guys. The self-assured and computer savvy boy was a miniature Bryan Nichols. Their short, spiky blonde hair was styled the same. They both loved to quiz each other with random trivia. The kid adored his dad. It turns out, they are. After CNN’s story appeared, and donations poured in to a college trust fund for Braydon, another group of soldiers and retired military members went to work to try to figure out what they could do. There were 32 children who lost a parent in the Chinook tragedy, and two of the wives of the men on board were pregnant, said retired Air Force Maj. Steve McLeary, the executive director of the Special Operations Warrior Foundation. The Tampa, Florida-based organization has been providing scholarships and assistance to kids and families of special operations personnel since 1980. Most of those on the Chinook were special operations. But five families who lost loved ones on the helicopter were Army and not in Special Operations, McLeary said. “We saw the CNN story and within 15 minutes we were on a call with board members who all agreed that every child who lost a parent on that helicopter would have their college expenses covered by us, whether their parents were special operations or not,” McLeary said. The foundation first sent all five of the Army families money — about $10,000 each — to cover expenses of traveling to Dover Air Force Base in Delaware to attend funerals, and to cover other expenses related to the tragedy. The foundation, which is funded by individual and corporate donations, worked with other charities to help pay for hotels for relatives who wanted to attend memorials. The Special Operations Warrior Foundation is covering all college tuition and room and board expenses for those children, too, McLeary said. The organization’s trained counselors work with each child in its program, checking in with them shortly after a death to offer professional counseling and anything else the family needs. The foundation stays in touch with children by sending birthday and holiday cards. The Special Operations Warrior Foundation reaches out to kids throughout middle school, calling them, asking how they’re doing and if they need anything. A foundation representative takes a more active role when the kid reaches high school by helping them prepare and pick a college. The Special Operations Warrior Foundation has over 900 kids in their program, McLeary said. More than 203 have graduated from college, and the organization is paying for 123 kids currently in college. Knowing all that is a comfort to the Nichols family. If Braydon’s first wish was that people never forget his dad, Monte Nichols said, his second is that no one forgets kids like him. Family Lives On Foundation supports the lifelong emotional well-being of children whose mother or father has died. Our Tradition Program provides opportunities for intentional remembering, creating a safe haven for grief, communication, and celebration. To donate, volunteer or for more information visit the Family Lives On Foundation website.